The pump concrete refers that the slump of the concrete mixture is more than or equal to 100mm, and use pump construction team. In the construction site, this type of concrete is usually poured through the pressure pump and the conveying pipe. At present, more and more production enterprises of concrete pump truck, technology is more and more mature, the height of pump can be chosen at different heights. Super high pump delivery of concrete pump height is relatively high, generally is more than 200m. 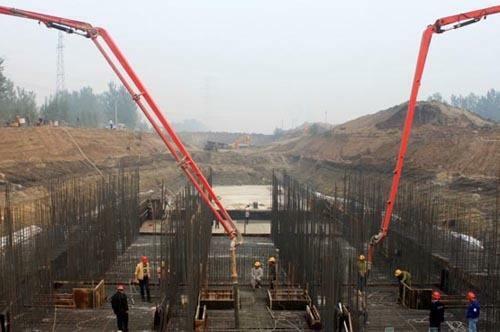 From the development demand of the construction industry, the ultra high pump concrete technology has become a major trend in the development of the industry, and it has an important position. Because of the development of urbanization and the tension of land resources, high rise buildings have become the first choice in many places. The application and development of the super high rise pumping concrete technology can improve the efficiency and quality of the construction and save the cost. Concrete may be closely related with the composition of materials, mix proportion, for large slump, the larger slump of concrete, the better its liquidity, on the condition of non separation of pulp, water free condition, the viscosity of concrete is more appropriate, not stuck on the wall of the conveying pipe. During transportation, concrete needs to add part of silica fume to provide lubrication performance, because the particle size of silica fume can be filled between aggregate and cement particles, which reduces friction. In addition, adding silica fume can improve the impermeability of concrete, can provide good package of concrete, firmly lock moisture, thereby preventing concrete bleeding and segregation phenomenon. 4. pay attention to the compatibility between the cementitious material and the admixture, and achieve the goal by using polycarboxylic acid admixtures with high water reduction rate. If you have any need or any question, please contact us by Email gaom@superior-abrasives.com or directly leave your message on the following form, thank you.